“Some are born Welsh. Some achieve Welshness. I am going to thrust myself upon Wales”. Jasper Rees is a thoroughly English man; born in London, educated at Harrow, and brought up to cheer whenever he crossed the Severn Bridge in an eastward direction. But despite this background, he admits to an “unfilled sense of ancestral belonging” whenever he crosses the border to visit his grandparents in Carmarthen. This is what the Welsh call hiraeth – a deep longing to be somewhere (the nearest you can get to it in English is probably “homesickness”, although the translation isn’t quite literal). Jasper’s hiraeth led him to establish Project Wales, an attempt to explore his Welsh ancestry, to reclaim his roots and to live up to his surname by way of a book deal that produced the wonderfully titled Bred of Heaven. So how do you set about doing something as nebulous as reclaiming your ancestry? Well, asking Welsh celebrity Bryn Terfel what he considers it takes to count yourself as properly Welsh seems like a good place to start. Bryn, as you might expect, sets the bar very high (he even reads the Mabinogion to his young children every bedtime), but ultimately he thinks Welshness boils down to one key defining characteristic: a willingness to learn and use the Welsh language. This, then, forms the first step in Project Wales. Jasper succeeds in finding a college in London that teaches an evening class in beginner’s Welsh, and attempts to wrap his cut-class accent around Welsh words. Just as confidence that this may be a doable project begins to set in, however, he comes face to face with the shock that hits every learner new to Welsh: mutations. Mutation is a system whereby certain words change (or mutate) in certain grammatical situations – in English it occurs in plurals (e.g. roof/rooves), but in Welsh it happens more widely, and it is the first letter of the word that changes. For example – “Wales” is Cymru, but “welcome to Wales” is croeso i Gymru. It’s a fiendish system, and for the beginner there really is nothing for it but learning these situations by heart and trying to remember to apply them in the correct places. Many a learner has thrown in the towel at this point, but Jasper perseveres admirably. He even getting to the point where he can attend an advanced week-long course at Nant Gwrtheyrn, the language centre on the Llyn peninsula (I attended for a couple of days on a school trip once, actually – it rained a lot), and compete in the Welsh learner of the year competition (he didn’t win). But learning and speaking the Welsh language alone isn’t enough for Jasper. He tries to find out what it means to be Welsh by trying out every clichéd Welsh activity in the book – coracling, singing in a male voice choir, competing at the Eisteddfod (in said choir), playing rugby, mining coal, lambing sheep, writing bardic poetry, visiting Welsh chapels and – just to make sure he has seen plenty of the country – walking both the full length of the Offa’s Dyke path and up Snowdon. I have done some of these things myself (the singing in a choir at the National Youth Eisteddfod, walking up Snowdon and spoken a few words of Welsh), and although I can only manages odd snippets of the language these days I am still rather pleased to conclude that I don’t need to mine coal or get crushed in a scrum to confidently consider myself Welsh. At first glance, I was a bit concerned that Bred of Heaven would be a patronising or superficial tour around my home country, and I braced myself for the sort of annoyance BBC reporting regularly induces in me (an English event happens in a named town; the same event in Wales happens “in Wales”). I needn’t have worried, however. Jasper is a man who clearly loves the land of his grandparents, and his enthusiasm comes across on every page. The whole book is a love letter to Wales, and he makes fun of no one but himself. To anyone who has ever misunderstood or been curious about Wales, here is everything you need to know: a whirlwind of history, geography, culture, heritage, sport, slightly odd bardic traditions, and plenty of keys words and phrases thrown in for good measure. 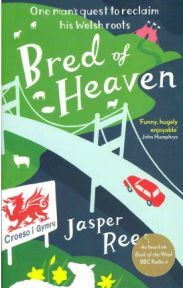 Bred of Heaven is an enjoyable book to read, whether you are Welsh or not (my English husband also rather liked it). Personally, I enjoyed it because it brought back so many memories of growing up in Wales: the choir practice, the Eisteddfodau (both the National Youth and our own school competition), the bits of language that I had thought I had entirely forgotten. It was painfully funny in places, and quite poignant in others. My only criticism is that Jasper’s ancestry is from South Wales, so the focus of the book is weighted in that direction, but not so much that a gog (northerner) can’t find it immensely readable. Recommended for anyone who is Welsh, wants to be Welsh or is just curious about Wales. Da iawn, Jasper! With thanks to Profile for providing this review copy – diolch yn fawr! 3 Comments on "Bred of Heaven"
It’s not the Welsh who have issues with BBC reporting – we Scots have similar problems.